*according to the disinfection standard EN1276 at 0.5% dilution, 5 min contact time. For disinfecting food contact surfaces (e.g. work surfaces): Put 11ml (1 pelican pump) into spray bottle and fill up with cold water to 600 ml. Clean surfaces first. Rinse. Spray surface with Milton solution. Wipe with clean damp cloth to cover the surface. Leave to air dry. For disinfecting non-food contact surfaces (e.g. floors, walls): Put 22 ml (2 pelican pumps) in 4 litres of cold water. Clean surfaces first. Rinse. 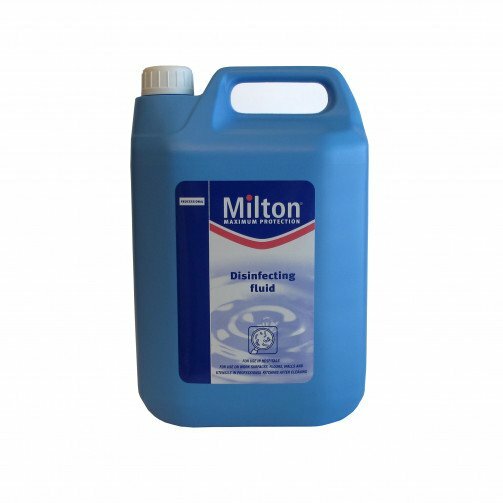 Wipe surfaces with Milton solution. Leave to air dry. For disinfecting & destaining utensils: Put 22 ml (2 pelican pumps) in 4 litres of cold water. Clean utensils first. Rinse. Immerse utensils in Milton solution. Leave for 5 minutes to disinfect. Rinse. For stain removal, leave immersed for 30 minutes. For hygienic cleaning of fruit and vegetables: Rinse to remove dirt/debris. Dose 50 ml (2 pelican pumps) in 10L cold water. Immerse vegetables/fruit in solution for 5 minutes. Rinse thoroughly. Q. I have tipped a full container of Milton over in my car, my trousers and socks have what look like bleach marks, will the carpet also mark like this? A. We can not say for definte but this product is a disinfecting/bleach so there is a good chance the carpet will also be marked. Q. Is it ok to use on babies bottles? A. Unfortunatley the Milton can taint the plastic/rubber so really we need to know what the bottle is made out of.